Yes the fire is real. Sometimes I burn myself, and yes it hurts. How long have you been juggling? I have been juggling most of my life - since I was about 6 years old. Can you eat an apple while juggling? Yes, in fact at your show I might do it while juggling a rusty old sickle. No, my mom won't let me. Will my kids like your show? Yes. Even the most difficult to please kids LOVE the Juggler Peter Show. Will my parents like your show? Yes, Peter's show is fun and entertaining for all ages. Parents, grandparents, and kids of all ages will have fun. Entertaining thousands of children and adults in more than twenty years of performing, Peter Brunette is a dynamic, passionate performer. Peter fell in love with juggling at the tender age of five after seeing his father juggle three balls. He has described this as the most impactful moment of his life; even more important than when he first discovered velcro shoelaces. He learned to juggle in elementary school and never looked back. In his teens he began performing for local parks, churches, and schools in his hometown of Minneapolis, Minnesota. Believing a college degree was necessary for success in life, he attended Hamilton College in upstate New York, and earned a degree in Biology because there was no juggling major. Peter is a former teacher. He taught science for two years at Crenshaw High School in Los Angeles as part of Teach for America. Later, he moved back to Minnesota where taught Math while performing juggling part time in the Twin Cities. 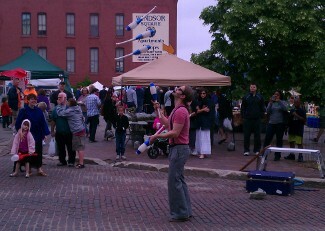 During this time Peter’s juggling was a fixture throughout the Twin Cities. He performed at diverse venues including the Suburban World Theater, Glenwood Elementary School, Toby Keith's Bar, and festivals throughout the Midwest. You may have learned to juggle from Peter at the Minnesota Renaissance festival. 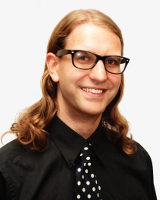 Peter is currently based in Omaha, Nebraska and juggling full time. 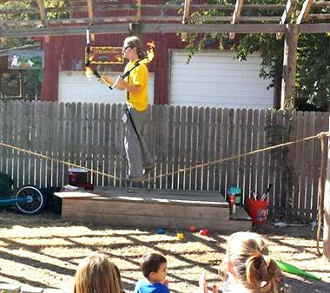 He has made a name for himself as Nebraska’s top juggler with signature tricks like blindfold knife juggling on a rolla bolla, and his incredible rope walking combination tricks. His impressive skills and hilarious juggling shows have brought him national attention and performances throughout the country as well as at Omaha’s top venues. Peter has received numerous awards and accolades for his juggling. These include an eXtreme Juggling Gold Medal, a Blind Juggling World Championship, four silver medals in the Minnesota State Juggling Championships, and a Bronze Medal in the Devil Stick. He even has a medal in joggling, a sport that combines running and juggling! His hobbies include juggling, rope walking, danger, baking, and death defying. He has a daughter, a cat and a smart phone. He is availalble to perform across the country.